1. Bas Kalle – Please tell us something about your background? Did you train any other Budo disciplines besides aikido? 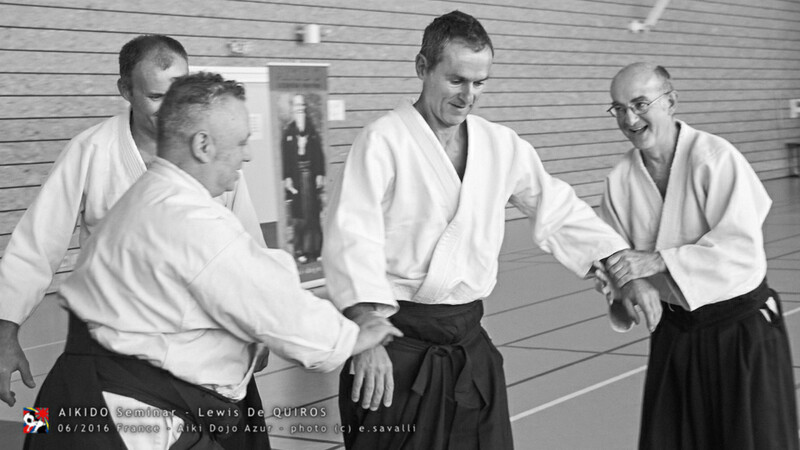 Lewis de Quiros – I began Judo when about 13 or 14 and Karate (Shotokan under Enoeda Keinosuke Sensei 9th dan) from about 17 years of age. I have been very lucky with my teachers. All were excellent teachers and people of exemplary character and personal power. I also trained Kyudo and Zen in Japan. A very important influence not only on my technique but on my understanding of martial arts as a whole has been Peter Ralston (Founder of Cheng Hsin). His twofold approach of Ontology and Martial Arts training taught me much and contact with him after Japan helped me understand what I had practiced there but until meeting him could not really understand. And of course my lifelong gratitude to Morihiro Saito Sensei [FR] which I can never adequately express. 2. [BS] There is a great difference between training and teaching aikido. 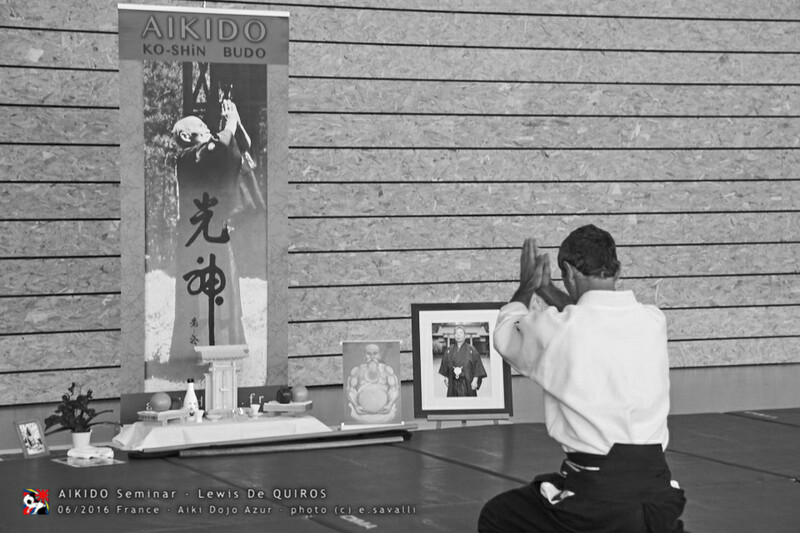 Do you remember when you decided to teach aikido and why? [LdQ] Actually I never had the intention to teach. My only experience in martial arts until the time I left Iwama was as a student. Upon coming back to Holland the first thing I did was (naively) to visit all the available dojos to see if I could join one. But of course everyone was doing a different kind of aikido with different basic and different weapon training from what I had learned. So to continue the training that I had l begun in Japan I started teaching but with the sole idea of training uke’s so that I could continue with my own practice. The first two years or so were pretty bad as of course the way I was taught in Japan was not a suitable model for westerners so I had to adapt my didactics quickly. However the turning point in teaching really came when it dawned on me that as a teacher I was in a very privileged position to learn. That the feedback I got from students was really an acid test of my own level of ability and capacity to teach. That if maybe I felt minimally confident about something but upon teaching it it fell apart this was really valuable feedback for me to reevaluate and look again and what I thought I knew. If you think you know something – teach it to someone else! That plus really looking at students. Really looking and perceiving someone else in process. Of the many things one perceives what to teach at that moment? What to say? And when to say nothing? In the end its all about connection and what that is really about on so many levels. So I am grateful for the privileged position of being able to teach and learn Aikido this way. 3. The question “what is aikido” is often asked, but is sometimes not easy to answer. Aikido can be practiced in many different ways and depends on personal experiences in life, development, etc. However, can you try to tell us what the essence of aikido is according to you and how you use this in your teachings and want to pass on to your students? [LdQ] Actually the longer I practice the more difficult it gets to answer this question! was it was like being totally controlled by his technique and yet feeling completely safe within his power at the same time. He would throw me in an irresistible way and I would get up with the feeling ‘wow, let’s do that again!’ Martial and joyful at the same time! 4. In Tendoryu we do not make much use of Kiai. From what I have seen you however do. Can you explain what the power of Kiai is for you and in general in aikido? [LdQ] Kiai means ‘coming together of energy’ so kiai is generally understood as the ‘shout’ emitted from the lower abdomen and therefore from the whole body, and delivered at a moment of concentrated pulsed power during a technique. From the historical record and many films we know that O Sensei used it as did Saito Sensei. So it is a part of our legacy. However it is much more present in weapons and in the focused moment of delivery in a technique that is more prominent there. If the form one practices (particularly in taijutsu) is ‘spread out’, and the delivery of transfer of power is extended in time and space the ‘focused moment’ and hence the need for the kiai is not there. Energy is transferred in a different smoother way. The energy during an encounter and during a technique is not even but is like a wave. Beginning, fulfilment and ending. Either stretched out with uneven twists and turns ( a long ki no nagare kaiten nage) or short sharp and direct (a direct irimi nage). But still a wave. I think we need to be able as aikidoka’s to play with these four types of ‘energy’. Kiai is clearly a part of this. And one humorous story on this topic. On my last visit to Japan and at one of the unavoidable parties I was able to ask a senior teacher why at a certain dojo I had visited kiai was absent from the practice. His answer: Well, the dojo is in a suburban neighbourhood and all the shouting would disturb the neighbours! (true story I promise!). 5. 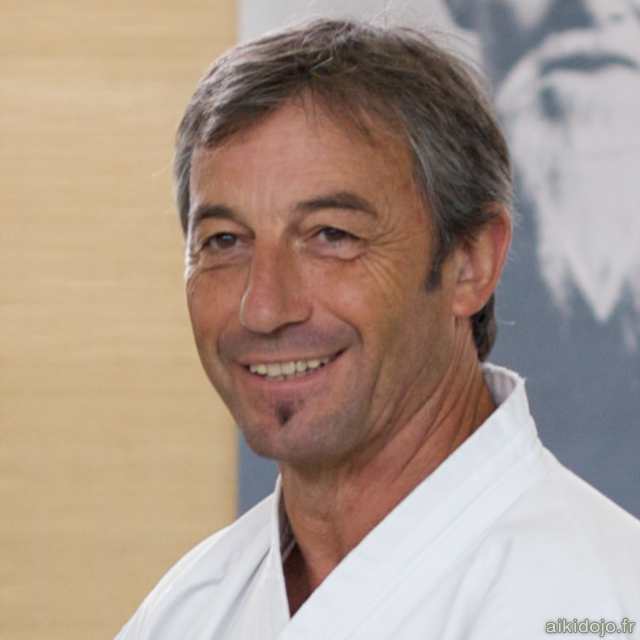 How important is the role of philosophy in aikido according to you? Is it really part of it, or is it something that people often want to identify with? give orientation but if it is real change and ability in a different domain of relationship and engagement we are after then just words, concepts and a new belief set will not help much. At best they can point us in a direction of exploration, investigation and practice. And then we need to jump in not knowing were we are going! Having teachers who ‘embody’ this new way of being is essential as well. So choose your teachers carefully! ! 6. Pour finir, souhaitez vous ajouter quelque chose qui pourrait nous servir dans notre pratique de l’aïkido ? [LdQ] To ruthlessly tear your practice down to the basics and understand what you are doing and why you are doing it. What are you really doing on the mat? What are you really trying to learn with all those endless falls and ikkyo’s? Don’t take anything for granted and don’t be fooled by grades or levels of attainment. Martial arts practice is a practice of consciousness. Of waking up to being present and responsive to the demands of the moment beyond the personal agenda of the person. To my mind then it can have meaning not only on the mat but beyond and not only as a martial art but as a way of life.